I was at Lowe's today and found a great light for attaching in the charge cover. 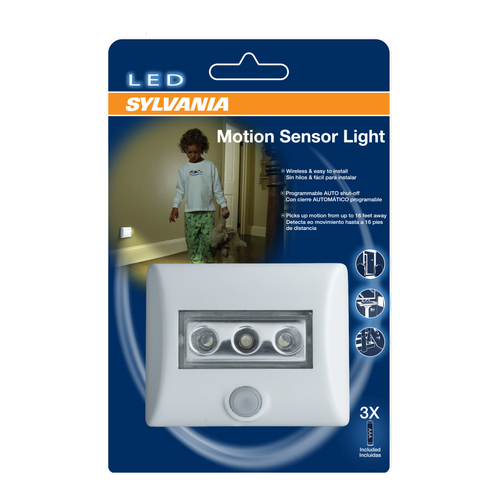 It is a LED motion sensor light that attaches magnetically. I put mine right about where the Nissan badge is under the charge hood. The light is powered by 3 AA batteries. It turns off after 60 seconds (or you can set it for 12 secs). The LED's can be tilted to focus light right where you need it. And the magnet is one of those strong types that means the light won't be bouncing around and falling off in there. No problem opening/closing the charge hood. I tested it out tonight and it works wonderfully and best of all - it's only $13 and it solves the whole lack of light thing when I pull into my dimly lit garage (I only have the garage door opener light). Last edited by SeattleBlueLeaf on Sun Feb 26, 2012 7:33 am, edited 1 time in total. Nice indeed. I shall grab one tomorrow!! Great find! I've been having the same issue with that dark little recess in my garage so will likely pick one of these up on the way home tonight..
You'll see that the magnet comes with it has a sticker on one side. Just remove the sticker side and stick it to the light. I turned mine so that the sensor is on the top side. This makes it so that it turns on when I come to unplug the car. It senses movement right about the time I get to the front of the car and lights up. I could take a picture of the setup but it is probably straight forward enough. It is probably obvious but I found the light in the 'lighting' section so you know where to look. No clearance issues ? Even with the QC port ? Actually, picture (day or night) with where it's attacjed would be nice. Won't the added weight reduce your range? And that mod won't void a lease!